Tymon Mellor has sent this photograph of the railway line and station at Fanling. This shows proper passenger carriages unlike the flat, open waggons shown in the image below. HF I had heard about this almost forgotten branch of the Kowloon Canton Railway but knew almost nothing about it. The line operated for exactly 16 years from 1 Apr 1912 to 1 Apr 1928, unless the source is pulling my leg, twice. It ran from Fanling Station to Sha Tau Kok. 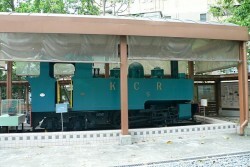 A steam engine on the narrow-gauge Sha Tau Kok branch line, which operated between Fan Ling and Sha Tau Kok during the period from 1912 to 1928. 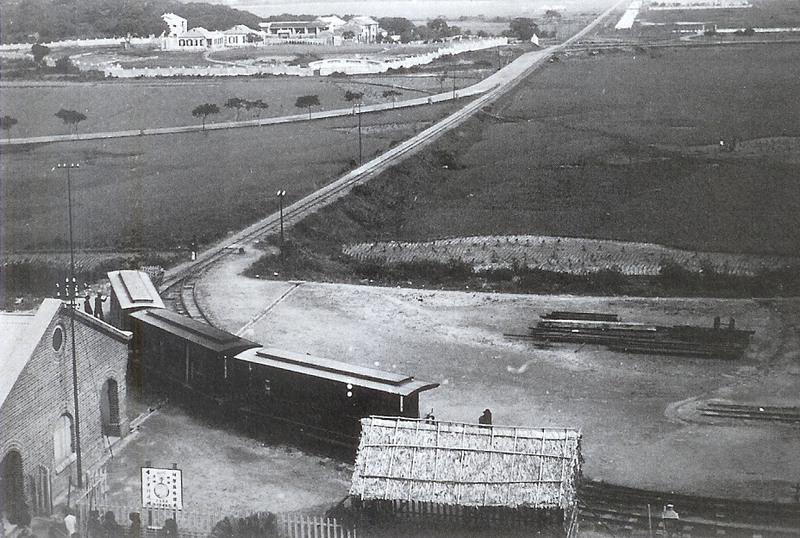 I think I read at the Tai Po Railway Museum that the railway line preceded a road. A quick check on the surprisingly detailed Wikipedia page suggests, “In 1924 the Hong Kong Government decided to extend the existing motor road from Au Ha to Sha Tau Kok. 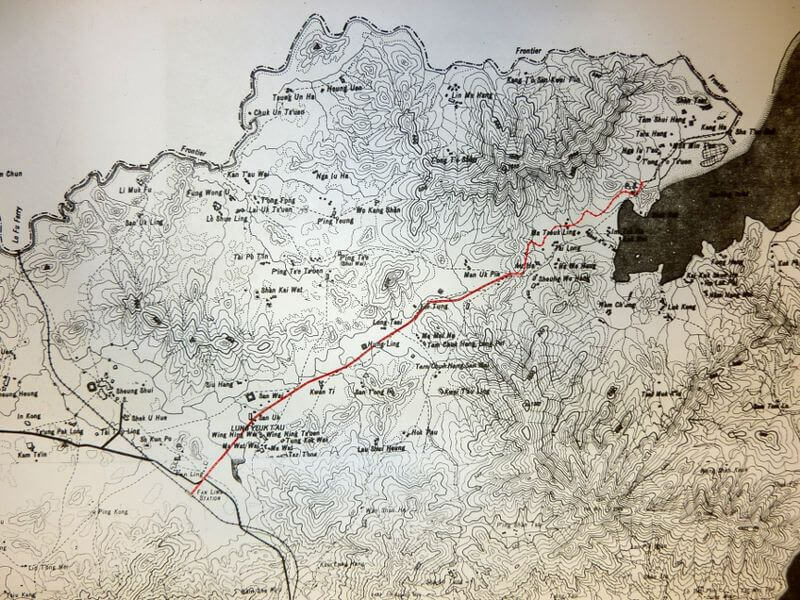 The line ceased operation … due to competition from motor vehicles using the recently completed Fanling to Sha Tau Kok Road.” The webpage below suggests some of the old rails and a tunnel can still be traced through the dense foliage of the countryside today. Where exactly? The tunnel shouldn’t be hard to locate if still there. 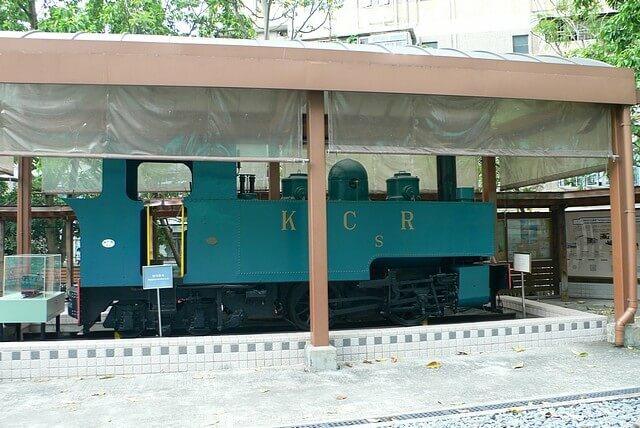 “These are images I took of the surviving KCR Fanling-Sha Tau Kok narrow gauge railway locomotives when repatriated to Hong Kong from the Philippines. 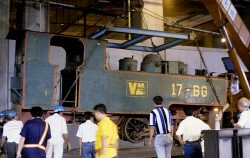 The location was the Fo Tan depot one Sunday in 1995. 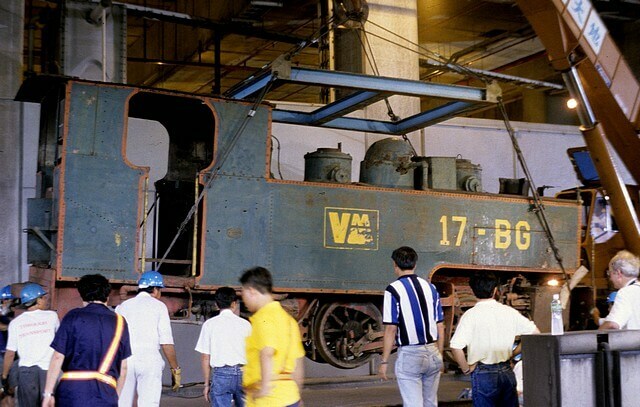 The locomotives had been in use on sugar plantations in PI for decades and were accompanied by their ‘balloon’ smoke-stacks which had been used to catch sparks from the Bagasse waste they burnt as fuel. Their very large tenders designed for Bagasse also came with them. 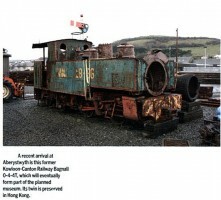 These had not been used on the railway in HK and were probably scrapped by the KCR. 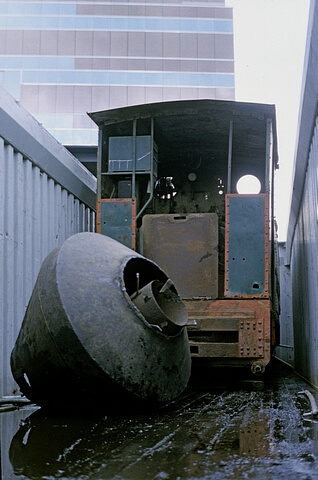 It was interesting that the locomotives and their accompanying bits and pieces were not strapped down in the containers in any way. I understand that the consignment was listed as scrap metal on the shipping manifests rather than what they really were. HF: From HK Museum of History 6/2/14: The Line officially opened on 20th Dec 1911 and fully opened in Apr 1912. It traveled “through” 5 stations, Fanling, Hung Leng, Wo Hang, Shek Chung (?) and Sha Tau Kok taking 55 minutes for the 12kms route. HF: This extract comes fom A look back : Civil Engineering in Hong Kong 1841-1941, by C Michael Guilford, originally published in three parts in Asia Engineer, the Journal of the Hong Kong Institution of Engineers in July, August and September 1997. This article was first posted on 8th September 2014.
http://www.checkerboardhill.com/2011/04/railway-abandonment-in-hong-kong/ interesting notes on several disused railways in Hong Kong including one serving the cemetery in Wo Hop Shek! Kowloon-Canton Railway (British Section) A History by Robert J Phillips, Urban Council, 1990. Chapter 6 is about the Fanling-Sha Tau Kok railway and includes 10 pages and a number of pictures. Probably not in print but almost certainly available in HK public libraries. Paul Tsui wrote about traveling from Fanling to Shataukok with his mother on that railway to go to the STK market on important festivals when he was a young boy. His family moved from HK Is to Fanling in 1925 when his father, Peter Tsui, founder of the two Wah Yan Colleges, built his own house, Shek Lo (Peter’s Lodge), at the Hakka Christian Shun Him Tong Village (Worship Humility Church Village) at Lung Yeuk Tau (Head of the Leaping Dragon). There was no market at Fanling. Shataukok had the major market at the time, The border was open for crossing without formality. There was a smaller market at Sheung Shui. Later, Peter Tsui and others, including his brother-in-law Pang Lok-sam, who was to become the first Chairman of the Heung Yee Kuk, formed the Luen On Tong – a local mutual aid alliance and developed the Luen Wo Hui Market of today. This is very interesting anecdotal history Lawrence about a time long before the new, large New Territories towns were developed. It seems strange now to think that Sha Tau Kok was a more important centre than Fanling or Sheung Shui. I don’t suppose you have any family photos of the STK railway? I have only seen the one in the article which shows people sitting on flat, open waggons, but surely there must have been carriages with seats? The light rail ran three times a day shuttling between Fanling & Shataukok. The railway was narrow gauge. It followed what is now the Shataukok Road, with a passing siding at Kwant Ti. On race days at Kwan Ti, additional shuttles were run for the punters. 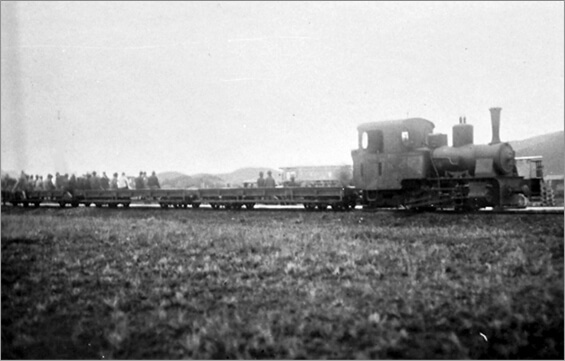 It was a three carriage train drawn by a small steam locomotive with a big funnel. It moved rather slowly. A brush “Touch Me Not” were planted extensively along both sides of this railway. They bore lovely purplish colour flowers; however, these were tarnished by the soot from the train. A marshalling yard with workshop and a coaling platform was built right next to the Fanling Station. Paul Tsui moved from Hong Kong Island to live in Fanling in 1925 when he was around ten. He spent his teenage years before the War growing up in Fanling, travelling daily on the KCR to go to Wah Yan College at Nelson Street in Mongkok. One was by boat from Hong Kong Island to Shenzhen via Deep Bay & the river to Lo Wu; then walk south from Shenzhen to Fanling. Alternatively, one could travel by boat to Kowloon City landing near Soong Wong Toi, then walk to Ngau Chi Wan, up to the Kwanyin Temple at Tzi Wan Shan, then across the ridge of Lion Rock to Shatin, down to Tsang Uk Wai passing the Amah Rock in the valley. One had the option of walking to Siu Lek Yuen to take a sampan across Tolo Harbour to Taipo; or walk there via the Che Kung Temple, Fotan, Ma Liu Shui, Cheong Shu Tan. From Taipo, one walk along the Lam Chuen river to Kau Long Hang and Tong Hang to Shum Him Tong Village which was along the main thoroughfare between Taipo & Shataukok in those days. On the way to Shataukok were: Lo Wai, Tzi Tong Chuen, Tung Kok Wai, Ma Mei Ha, Wor Hang, Hung Leng, Lai Tung, Shek Chung Au. Indeed, this Christian Hakka village, Shung Him Tong Chuen, literally translate as “Worship Humility Church Village”, was established by the Chinese preachers of the Swiss Basel Mission who used to take a mid-way break here while shuttling, on donkey’s back, between their parishes at Shataukok & Taipo. When they retired, they built their uniquely Christian village here naming it Shung Him Tong Village. The parish cemetery is located at the rear of the village at what has been described as the pearl spit out by the Head of the Leaping Dragon (Lung Yeuk Tau). When the village was well-established, they also developed the Luen Wo Hui Market as well as initiated the Heung Yee Kuk for the New Territories. 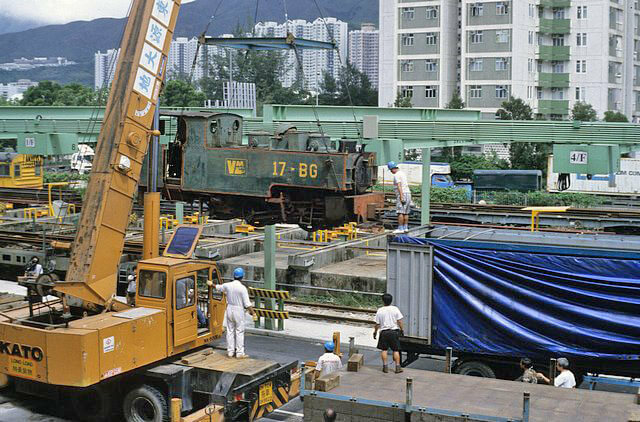 I have posted the information directly related to the Sha Tau Kok railway in a new post: The Sha Tau Kok railway – further information. It’s very interesting to read about how people moved about the New Territories before the KCR was built especially using boats. I walk a lot up in this area and there are still many fine stone footpaths some of which might be hundreds of years old. A minor correction. 火車頭 does not mean train station. It means literally “train head” or the first car in a train, which is usually the locomotive, or the car that contains the engine of the train. I have inserted your comment directly into the article after the mention of 火車頭. As a non-Chinese reader or speaker it’s always good to be corrected. Please let me know if you find any other errors on the website.